Winter in California means rain. In fact, the state just had its first rain of the new season over the previous two days. But the weather forecast suggested there might be an opening in the clouds —and an opening for me to get out to this location well before dawn. I pulled myself out of bed and made my way to the iconic Golden Gate Bridge, excited to capture the sunrise. One thing I hadn’t counted on? A thick soup of fog. I could barely make out the glow of the bridge’s steel trusses, and I had no idea whether or not the fog would lift. Fog or no fog, I decided to stick around to watch the sunrise anyway. I was rewarded with a spectacular morning show. As the sun rose, the fog receded, slowly unveiling the bridge and some glimmering clouds, too. 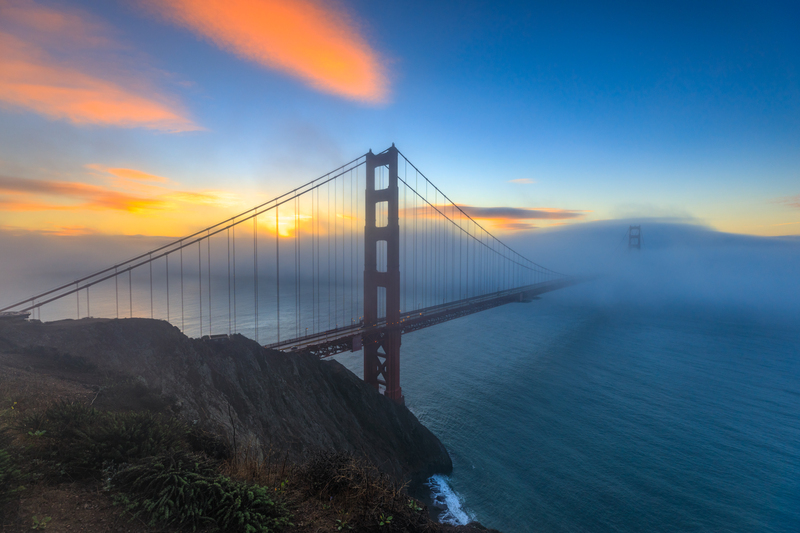 San Francisco’s iconic Golden Gate Bridge stretches through the fog. I’ve captured many of my favorite images simply by showing up and sticking around. Whether or not I end up with the shot I wanted, I always enjoy watching nature do its unpredictable, mysterious, beautiful thing. ← Mesquite Sand Dunes Sunrise!